What do you get when you blend an excellent 3D plasma TV with a 3D Blu-ray home theater in a box, a fine high def camcorder with 3D capabilities, three sets of 3D glasses and a couple of 3D demo discs? In my case, it was hours of otherwise productive time sitting in front of the idiot box, 3D glasses on my face, trying to figure out if this 3D push is worth the time of day. I'd been dying to try an honest-to-goodness 3D home theater in Chateau Bray to help me find out if 3D is for real or – as I assumed – just hype, so when Panasonic offered to lend me all I'd need (short of a 3D projector) for a fair test I jumped at the opportunity. The heart of the system was Panasonic's $1900 TC-P50GT30, a 50 inch 3D plasma that's a real beauty. The first thing that struck me about it was how slim it was: I have a two year old plasma of identical screen size that serves me extremely well and which I had thought has a nice thin case – but compared to this brand new Panasonic it looks almost like a CRT! Okay, that's obviously a bit of an exaggeration, but it's a valid point. These things are getting so thin you'd almost think you could roll them up when you're not using them! Anyway, the Panasonic TC-P50GT30 plasma's picture looks even more fantastic than its profile. Blacks are superbly deep, colors lively and real and the whole picture just about pops off the screen at you even in 2D. It's a wonderful experience. Panasonic uses "fast switching phosphors" in all its full HD models to, the company says, reduce afterglow, which they claim should help the TV differentiate the left-and-right-eye images better. Setup is easy, thanks to menus that are thought out logically, and the remote is easy to figure out as well. 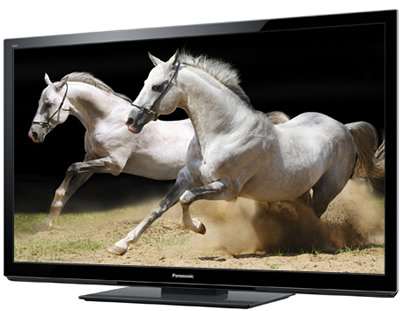 According to Panasonic, the television uses "Full-HD Frame Sequential technology to create its 3D images. Images recorded in 1920 x 1080 pixels for both the right-eye and the left-eye alternately flash on the screen at the ultra-high rate of 120 frames per second. When you view the screen through active-shutter glasses that open and close each lens in sync with the alternating images, you see breathtaking FULL HD 3D pictures with stunning power and realism." Maybe. Actually, we noticed some flicker at times while watching "Avatar" in 3D, and the overall experience made my eyes feel tired, though not as badly as I had feared going into the test. The TC-P50GT30 has enough inputs to choke a horse, including four HDMI, three USB and one for your computer. You can also network it, and either partake of the fleshpots of cyberspace directly from it, or from the also-networkable SC-BTT770 Full HD 3D Blu-ray Disc home theater system Panasonic also sent. The TV's weakest point, as with most of them, is the audio output. Its specs claim a mere 20 watts per channel through full range speakers, which is competitive but hardly earth shattering. I didn't care, however, because the only time I actually use the TV's audio is with programs for which sound quality isn't important. When sound does matter, I fire up the separate audio system and have at it. 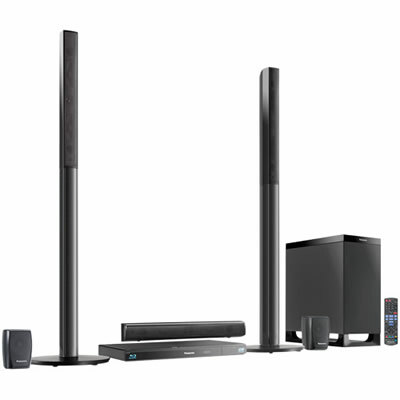 Speaking of audio systems, the SC-BTT770 audio system with which Panasonic paired the plasma comes complete with a 3D Blu-ray player/audio head unit and full 5.1 surround speakers, including a small subwoofer whose deep bass surprised me quite pleasantly, and "kind of wireless" rear speakers. By "kind of wireless," I mean there's no physical connection between the rear speakers and the head unit up front. Instead, there's a wireless receiver you park at the back of the room (I stuck it behind the futon on which we sat, next to the rear wall), and then run wires from it to the rear speakers. It does seem kind of silly to have a wireless system that still needs wires, but at least they aren't running all around the room. Setup of the head unit and its speakers is pretty simple, with color coded speaker terminals and a decent quick start guide. The system puts out decent sound for its $599 price, with very good channel separation. I thought it a tad challenged with the higher frequencies, though, enough so that I mentioned it to my compatriots as we basked in the glow of the fantastic 3D presentation of "Avatar." They tut-tutted that it sounded fine considering its price and its mandate and assured me that most people would be perfectly satisfied with it. They're undoubtedly correct; I've just been spoiled by living with higher end equipment. There's a a dedicated Netflix button on the audio system's easy to use remote and the on-screen interface is straightforward as well. It also has built in WiFi access to a variety of streaming delights (including Skype), comes with a built in iPod/Phone dock (a very nice touch, indeed), an optical audio input, two HDMI Inputs and one output. I used the SC-BTT770's second HDMI input to hook in my PS3 so I could try driving a couple of Gran Turismo 5 races in 3D. It was pretty cool, but I'd like a second opinion from someone who sees more depth than I. That's because, to me, 3D doesn't pop out of the screen. Rather, it appears as if the TV screen is a window onto a 3D world beyond it, which can still be pretty cool but which, apparently, isn't all 3D can be. I discovered this, much to my chagrin, when my wife and my friends starting talking about how the images were appearing in the space in front of them, almost as if they could reach out and touch them. Yet I saw none of that! It was very weird and quite depressing. I cried myself to sleep that night. Panasonic also sent a demo disc and a second 3D movie, "Ice Age: Rise of the Dinosaurs." The Ice Age movie was so bad my wife and I bailed on it after about half an hour, spending the rest of the evening with the demo disc, whose Italian cars, soccer, golf, weird artsy-fartsy stuff, game excerpt and the like was far more entertaining than Ice Age. This just goes to show that whiz bang 3D effects don't make up for lousy writing. The 3D glasses are kind of cool, if annoying; my guinea pigs were unanimous in saying that 3D isn't anywhere as long as you have to wear them and it wouldn't surprise me if they're right. Oh, it's easy to charge them via USB, and they aren't as silly looking as those red and green glasses of old tech 3D – but if you wear glasses already you have to wear the 3D glasses on top of them and the flicker and eye fatigue are enough to make me use 3D only for special occasions. And, of course, your audience is limited by how many sets of the $180 glasses you can afford. Panasonic also sent me the HDC-TM900 3D camcorder, with the VW-CLT1 3D conversion lens, and I took them on vacation to check them out. The camcorder is a beauty, tiny enough for single handed operation yet it can put out up to 1080p video that's stunning. You can also use it as a "still" camera, in case you want to take pictures of a moonshining operation. The heart of the camcorder is a three-sensor 3MOS Sensor Panasonic says provides a resolution of 7.59 million effective motion image pixels (2.53 million x 3). The sensor splits light entering the Leica lens into the three primary colors and processes each with its own sensor. The claim is that "This reduces light loss compared to the 1MOS sensor, and renders colors, details and gradation all with intricate detail and natural beauty." I'm not an expert on such things, but I can tell you with confidence that the camcorder records spectacular images. The 12x optical zoom and 20x "Intelligent Zoom" work well, though of course the more you zoom the more you'll want to steady your arm on something, even considering the camcorder's build in image stabilization. As a digital still camera, the HDC-TM900 will capture 4x3 images of up to 14.2 megapixels and 12.2 megapixels at my preferred 16x9 aspect ratio. Put that 3D adapter on the camcorder and it becomes another beast entirely. The converter, which is an ordeal to install, turns the regular HD video you're shooting into a pretty decent 3D, but at the expense of flexibility: you can't zoom or do much else in the way of tweaking the picture and the best 3D depth of field comes between something like four and 12 feet away, which really limits its use. On playback, the 3D images don't fill the entire screen, though it's fairly close. The 3D effect is pretty good – or at least as good as my obviously flawed eyes could tell. My guinea pigs thought they looked great. If you really want a 3D camcorder, this one will definitely do the job for you. It's a better 2D camcorder/still photo camera, though – in fact it's a superb one, and it's a lot easier to haul and use without the 3D adapter on it. I took a variety of shots – mostly in 1080p or AVCHD, ranging from wide open mountain vistas to dimly lit bedrooms. Nothing I shot really pushed the camcorder's capabilities – which are prodigious; I basically used the camcorder pretty much the way most people on vacation would: point and shoot, and it was very easy to use. Switching to 3D involves more than just screwing the adapter on carefully; there's a calibration process in the mix as well, done via the camcorder's LCD touch screen. It isn't particularly onerous, but it is a rigmarole. Five electret condenser microphones give you supposedly 5.1 sound, and I was quite pleased with the audio playback quality, which had a nice ambience that helped make the audience feel more a part of the action. A Zoom Mic function is supposed to improve its noise-reducing abilities at higher zooming powers. The unit comes with 32GB of flash memory, which was more than I needed for the trip, and you can add an SD card if you run out of storage space. The controls fall to hand well and the touch screen interface is easy to get the hang of. You can output your work via mini-HDMI or USB, to play back and/or copy material from the unit to your computer or TV. I had a one meter HDMI/HDMI adapter, which meant I had to leave the camcorder over by the plasma TV to use it; fortunately, it comes with a little remote you can use from across the room. The HDC-TM900 camcorder made me marvel at how far consumer video has come since I first hoisted a "portable" video camera onto my shoulder back in the late 1970's. The $1100 unit offers fantastic performance in an easy to use package – with enough manual adjustments to make it attractive to more serious videographers. The fact that it can do 3D may be an extra selling point, though I don't think the extra few hundred bucks the adapter requires are really worth it unless you're very serious about 3D. 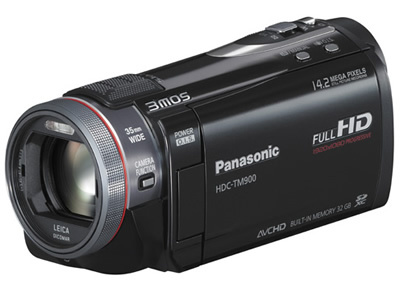 Full marks for the HDC-TM900 camcorder and the TC-P50GT30 plasma. Both are excellent products that perform their anointed tasks beautifully. The SC-BTT770 Full HD 3D Blu-ray Disc home theater also offers good performance, as long as you aren't an audio/video snob with high end tastes. It doesn't take up much space, it's flexible enough to let you hook in a second player or game console, offers a kind of wirelessness for the rear speakers, and yet it'll still rock your room nicely when you crank it. For six hundred bucks, including the Blu-ray player, the amplifier and the speakers, how can you go wrong? But 3D itself? I'm still not sure if people are going to care enough about it – and I obviously don't get the effect out of it that others do – but apparently it does offer a bit of a "gee whiz" experience for those whose eyes function correctly. Whether it's hanging in the air between you and the TV or in that 3D world that exists behind the TV, the 3D 1080p picture quality is excellent. As good as it is, though, it never looked "real" to me. Instead, it reminded me of those old fashioned "View-Master" stereoscopic slide thingies I had as a kid, offering definite depth but with a sense of unreality as well. I guess we'll all find out soon enough whether people think 3D offers enough value to be worth their after-tax disposable dollars. In the meantime, no one's going to hold a gun to your head and force you to watch stuff in 3D even though the equipment is capable of it. And to that end, these Panasonic 3D home theater components not only excel in three dimensions, they do at least as good a job in 2D as well, so even if the technology doesn't take off you'll still have a fine home theater.